Da Capo Lifelong Books, 9780306818448, 280pp. What do you do when you love your farm . . . but it doesn’t love you? After fifteen years of farming, Catherine Friend is tired. After all, while shepherding is one of the oldest professions, it’s not getting any easier. The number of sheep in America has fallen by 90 percent in the last ninety years. But just as Catherine thinks it’s time to hang up her shepherd’s crook, she discovers that sheep might be too valuable to give up. 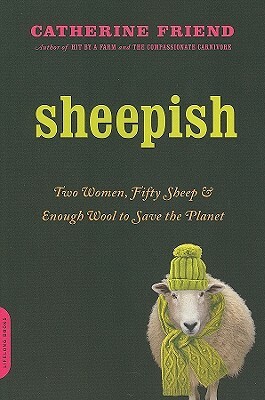 What ensues is a funny, thoughtful romp through the history of our woolly friends, why small farms are important, and how each one of us—and the planet—would benefit from being very sheepish, indeed. Catherine Friend is the author of Hit by a Farm and The Compassionate Carnivore, as well as seven children’s books and three novels. She farms in Minnesota with her partner of twenty-eight years. “Wry, witty, and honest, Sheepish describes a magical personal transformation—from urban to rural. Catherine Friend finds meaning in the middle of life, love and even knitting projects. Friend brings out the urge to farm in knitters, spinners, and ‘fiber freaks’ everywhere, teaching us to find joy and contentment in the small, sheepy parts of our world.